From high-rise luxury living to the best in hospitality, retail and leisure, Nakheel put seven new developments on parade at Cityscape Global. Dubai’s Nakheel launched a plethora of real estate projects at Cityscape Global, with seven developments collectively worth Dh4 billion ($1.08 billion) taking centre-stage at the property show. Nakheel unveiled a luxury high-rise beachfront residential project on Palm Jumeirah; a residential tower collection at Discovery Gardens, a mall, hotel and health complex at Discovery Gardens; a unique collection of homes and leisure attractions at Jumeirah Park; a new hotel at Jumeirah Village Circle; and six marinas for a total of 614 boats and yachts at Deira Islands. Palm Beach Residences ... high-rise attraction. This is a brand new high-rise residential tower on the Palm Jumeirah. It features 250 one-, two- and three-bedroom apartments topped off by a 38th floor sky lounge with commanding views of the Arabian Gulf and Dubai skyline. There is emphasis on landscaping, greenery, health and well-being, with a host of sports, health and leisure facilities including a pool, gym, tennis courts and clubhouse. There are also retail and dining attractions. Construction is expected to begin in Q2 2018. This is a collection of nine towers with 2,500 apartments between them, in a new, gated community at Discovery Gardens. Named after the Arabic word for ‘gardens’, Jenan Heights sits in extensive communal green space with an array of onsite facilities including a pool, jogging track, gym and clubhouse. There will also be convenient retail and dining attractions within the community. Jenan Heights is due to break ground in Q2 2018. 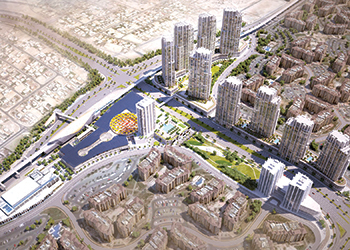 This project combines shopping, dining and tourism facilities at the heart of one of Nakheel’s biggest communities. With more than 370,000 sq ft of new shop space and a 350-room hotel, Discovery Gardens Mall will transform the existing Discovery Gardens Pavilion into a retail, hospitality and healthcare complex. With 1,000 car park spaces, the mall will have over 450,000 sq ft of leasable space in total. Construction is expected to begin in Q2 2018. This comprises 174 luxury four-bedroom residences at Nakheel’s Jumeirah Park community. With an emphasis on outdoor space and natural light, the homes range from 3,650 to 4,150 sq ft and come with a private garden, rooftop entertainment space, maid’s room, study and double garage. Construction is due to start in Q2 2018. This is a brand new health, fitness and wellbeing complex that features a 50-m, Olympic-size swimming pool, a 16,000 sq ft gym and a spa. It is located at the heart of the sprawling, high-end Jumeirah Park community, combines unrivalled sports, fitness and wellbeing facilities with a range of dining and entertainment amenities, including a nursery, restaurants, cafes and shops. Construction is expected to begin in Q2 2018. Nakheel’s new, 252-room hotel at Jumeirah Village Circle (JVC) provides a mid-scale hospitality offering at the rapidly-growing master community. The hotel will have an all-day restaurant, café, pool, gym and car park. Nakheel is currently in talks with several prospective operators for the hotel, which is due to break ground in Q2 2018. The JVC hotel brings Nakheel’s hospitality project portfolio to nearly 6,000 rooms across 17 hotel and serviced apartment complexes. Nakheel is investing Dh165 million ($44 million) to build six marinas at its Deira Islands master development. Accommodating 614 boats and yachts up to 60 m in length, the marinas are due for completion by the end of 2019, with phased construction starting Q4 2017. 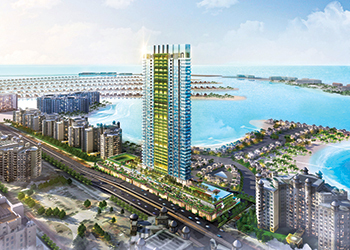 Nakheel has invested Dh7.5 billion ($2.04 billion) in contracts for Deira Islands so far.